kate love photography: Happy Harry Potter Premiere Day! Happy Harry Potter Premiere Day! That's the text I got from Kristen today, and I couldn't agree more. The day has finally come, the first installment of Harry Potter and the Deathly Hallows premieres tonight. We're going to the midnight showing, and I've been working on my costume today. 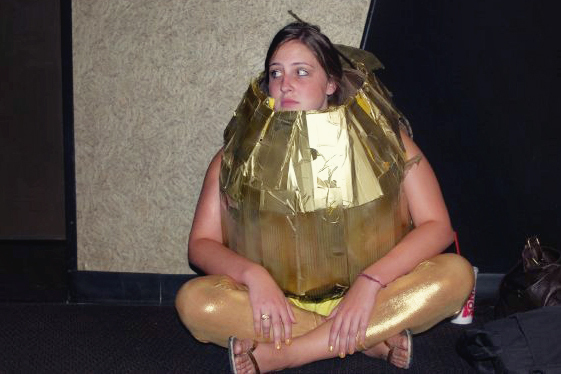 I don't think I'll ever top last year though...the golden snitch. That snitch costume got me into the school paper and on the local news! It has wings too, you just can't see them in this pic, and it only cost me like $5 to make. And if I had more time, I'd make these butterbeer cupcakes (found by Jean). kate! what did you dress up as? !